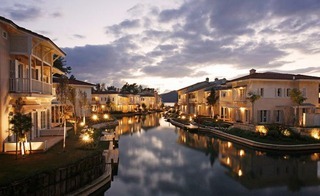 Gocek is the sublime meeting place of rural tranquility and contemporary comfort. Here are pleasant, well-kept seafront bars and eating establishments, well-stocked little shops and a clean, pretty market square. Walking along the seafront is a delight, the coastal hills rising all around and bowsprits of all kinds bobbing maritime greetings to you. Kaya Koy, or Ghost Town, is an easy day trip and very inspiring with its impressive old Greek settlement. The popular Ölü Deniz offers a nice beach day, if you are fortunate to be able visit in the off season, otherwise the tourist crowds detract from the beauty. 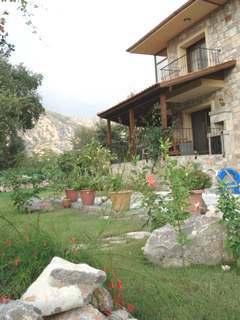 Being just twenty minutes from Dalaman Airport makes this the definitive place to begin or end your holiday. 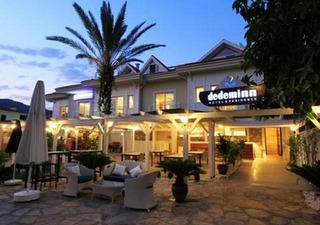 Dedeminn Hotel & Residence is located at the center of Gocek. Some rooms have wonderful views to Gocek Bay and others to beautiful forest mountains bechind Gocek town. The rooms are beautiful decored in natural stone and wonderful wholesome fabrics. Only 800 metres to the beachfront, D-Marin is located in the yachting heaven Gocek. It offers an outdoor pool, a sauna and air-conditioned rooms with LCD TV and balcony. Efe Hotel is offering you wonderful simple comfort The Grounds are very well landscaped so although few mins walk to town yu feel very rtemote and quiet. The pool is a nice relief if you have enjoyed a full day touring.. Spacious rooms and suites are tastefully furnished. Many rooms feature balconies and optional coffee making facilities. Brand new Villas with shared pool. Only 300m far from seaside. These luxury Port Villas( Villa Anya & Villa Nyla ) villas located in one of the most exclusive bays in the mediterranean, Portville , is ideal for people who seek harmony with nature. The luxury villas, directly connected to the sea by canals are extremely well appointed and each has direct views of Gocek Harbour and Port Gocek Marina. Villa Danlin Hotel Gocek Fethiye Turkey at only 22 km from Dalaman International Airport, Göcek is a quiet and peaceful village of great charm on the south Aegean coast.